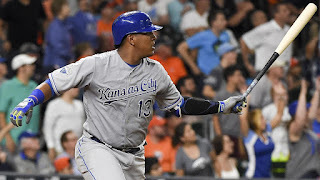 Salvador Perez followed a two-out walk by Alex Gordon by clubbing a two-run home run to left field off reliever Ken Giles to break a tie in the eighth inning and Joakim Soria picked up his first Royals save since 2011 as the reigning World Series champions hung a second consecutive loss on the Astros, 4-2, on Wednesday night at Minute Maid Park. Astros starter Scott Feldman held the Royals without an earned run in his 6 1/3 innings, but the Royals took a 2-0 lead against him in the sixth when Feldman made an errant throw to first and allowed Lorenzo Cain to race home. "They took advantage of a couple of mistakes," Astros manager A.J. Hinch said. "It's capitalizing on any opportunity that you get, and they did a better job of that than we did on the opportunities they got. They did a little better job of getting the outs when they needed to." Jose Altuve led off the bottom of the sixth with a long homer to left field off Royals starterYordano Ventura to make it 2-1, and he tied the game in the seventh against Luke Hochevar when he shot a double up the middle past a drawn-in infield to score Jake Marisnick, who ran for Jason Castro after Castro hit his second triple of the season. Altuve was stranded when Hochevar struck out George Springer and Carlos Correa. Ventura went six innings, giving up one run while striking out six. "I felt Ventura's pitching was fantastic," Royals manager Ned Yost said. " I thought he threw the ball really well -- some of the best curves I have seen him throw … ever. Really nice tilt on those. Really good changeups, too." Feldman's error is costly: Feldman carried a shutout into the sixth inning before a throwing error led to a pair of unearned runs. The 6-foot-7 right-hander darted off the mound to fieldKendrys Morales' one-hopper near the third-base line, and he sailed the throw to first after faking to third. Cain scored from third, and Eric Hosmer went from first to third and later scored a Perez sac fly. Yo's pressure pitch: Perhaps down to his last batter, Ventura made a clutch pitch to Carlos Gomez with the bases loaded and two out in the sixth with the Royals up, 2-1. Ventura already had given up Altuve's leadoff homer, and the inning was extended with a rare error by shortstop Alcides Escobar with two outs. But with the count 3-2 to Gomez, Ventura threw a fastball on the inner half and Gomez, who tried to check his swing, grounded out weakly to second base. Big Sal's big fly: Perez hit his first homer of the season, feasting on a Giles breaking ball that caught too much of the plate on a 3-2 pitch. Giles had baffled Morales with several curves, inducing a strikeout two hitters earlier, but he walked Gordon on a borderline 3-2 pitch. Perez then worked the count full and seemed to be sitting on a breaking ball. He belted a no-doubter to left. "I was just to trying to protect the zone," Perez said. "I saw him throw Alex a 3-2 slider, and he took a walk. I was just trying to protect and I hit it pretty good." Giles allows another shot: Giles, who allowed only two home runs in 70 innings with the Phillies last season, surrendered his third homer in only his fourth appearance for the Astros when Perez took him deep in the eighth for the game-winner. Giles' ERA is 12.27. Astros reliever Chris Devenski struck out the side in the ninth in the second Major League outing of his career. He has seven strikeouts in four innings, which ties the club record for most strikeouts by a reliever within his first two games (Don Wilson, 1966). Royals: Ian Kennedy (1-0, 0.00 ERA) takes the hill at 7:10 p.m. CT on Thursday in his first road start as a Royal. The right-hander threw 6 2/3 innings of shutout ball against the Twins on Saturday. Astros: Right-hander Doug Fister (1-0. 5.40 ERA) makes his first home start at Minute Maid Park on Thursday when the Astros face the Royals in the final game of this four-game series.